The latest domino to fall in Miami may be the Marlins' biggest catch yet. On Thursday night, Miami and Milwaukee struck a deal to send All-Star outfielder Christian Yelich to the Brewers in exchange for baseball's No. 13 prospect Lewis Brinson, infielder Isan Diaz, outfielder Monte Harrison and right-hander Jordan Yamamoto. Miami mined a strong Milwaukee system that featured six prospects on the Top 100 prior to the deal. In addition to the former top Brewers prospect Brinson, No. 6 Diaz stands at No. 86 overall. They became the Marlins' only representatives on that list, while the Brewers still have No. 59 Corey Ray, No. 70 Luis Ortiz, No. 81 Brandon Woodruff and No. 82 Keston Hiura. "Christian Yelich is a talented player, as were all of the players we've moved this offseason," Marlins president of baseball operations Michael Hill told MLB.com. "You want to get talent in return. 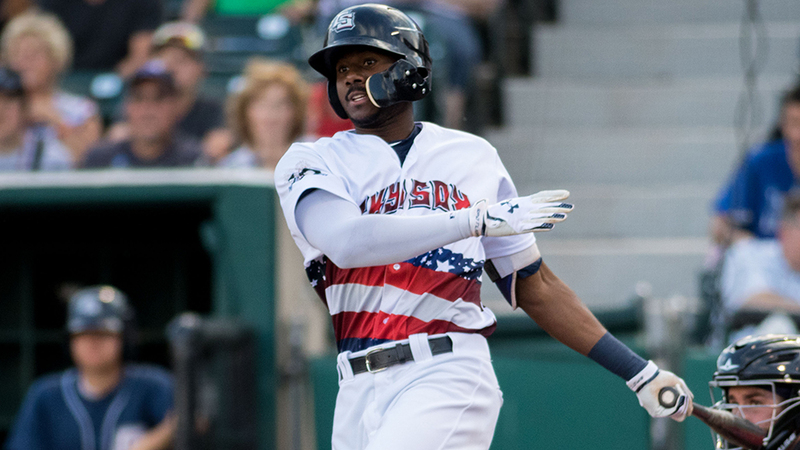 You want to get impact, championship-caliber players, and that's what Lewis Brinson is. That's what Monte Harrison is. That's what Isan Diaz is, and that's what Jordan Yamomoto is." Miami swapped an All-Star for prospects for the third time this offseason. The Marlins acquired their previous No. 1 prospect Sandy Alcantara, No. 5 Magneuris Sierra, No. 15 Zac Gallen and left-hander Daniel Castano from the Cardinals for Marcell Ozuna. They also got then-second-ranked Jorge Guzman and infielders Starlin Castro and Jose Devers in a deal that sent reigning National League MVP Giancarlo Stanton to the Yankees. Brinson, 23, made his Major League debut last June after six years in the Minors. The new top Miami prospect played 21 games with the big club and went 5-for-47 (.106) with two homers. The 2012 first-round pick spent the majority of the season with Triple-A Colorado Springs, where he batted .331/.400/.532 with 13 homers, 66 runs scored, 48 RBIs, 22 doubles over 76 games. The 6-foot-3, 195-pounder played mostly in center field before his season was cut short in mid-August by a hamstring strain. Brinson was traded for an All-Star for the second time in his career. He was part of the deal that sent catcher Jonathan Lucroy to Texas in 2016. After 110 games with Class A Advanced Carolina, Diaz's season also ended prematurely when the 21-year-old suffered a fracture in the hamate bone on his right hand that required surgery. The native of Puerto Rico -- slotting in at No. 9 with Miami -- batted .222/.334/.376 with 13 homers, 59 runs scored, 54 RBIs and 20 doubles in his second full season. He played the majority of his games at second base, but also spent some time at shortstop for the Mudcats in 2017. Harrison, formerly the Brewers No. 14 prospect and now No. 2 for the Marlins, took a big step forward after dealing with injuries. The 22-year-old had surgery in 2015 to repair a fracture in his left tibia and a dislocated fibula in his left ankle. He began last season with Class A Wisconsin and batted .265/.359/.475 with 11 homers and 32 RBIs. He was promoted to Carolina in late June and finished the year with the Mudcats, where he amassed a .278/.341/.487 slash line with 10 homers and 35 RBIs. The Brewers' 2014 second-round pick stole 27 bases and saw time in all three outfield positions, though he mostly played center. Yamamoto hurled 111 innings for Carolina in 2017, the second consecutive year the 21-year-old eclipsed 100 frames. The Hawaii native notched a 9-4 record over 22 starts. He struck out 113 and sported a 2.51 ERA that topped Carolina League pitchers reaching 100 innings. He allowed just one earned run and struck out 34 over his final five starts of the season spanning 33 innings. "I'm looking forward to watching us play," Hill told MLB.com. "There's a lot of reason for our fans to be excited. When you think about the existing pieces that are still on our roster, the young players that we've been able to add ... there's athleticism, there's speed, there's power arms. I'm excited to see those guys report to Jupiter and to see them get ready for the upcoming season."